BBC NEWS | Health | Is this the perfect comedy face? Is this the perfect comedy face? Scientists have used computer software to come up with what they say is the perfect comedy face. 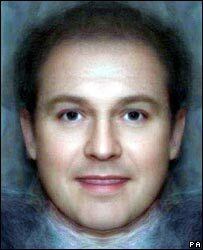 The University of Stirling team blended together 179 different facial aspects of 20 top comedians. They said soft and feminine features, typified by Ricky Gervais, were more likely to make people laugh. 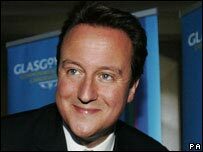 The researchers also concluded that Conservative leader David Cameron, unlike Tony Blair or Gordon Brown, has features prone to make people laugh. However, they said it was questionable whether a funny face was an electoral asset. Researcher Dr Anthony Little, a psychologist, whose work was commissioned by Jongleurs comedy clubs, showed faces with a range of different features to volunteers, and asked them to rate how funny they thought the person was. He said: "The features most likely to mark male comedians out for success are predominantly soft and feminine. Cameron: Game for a laugh? "The face is a strong indication of character, and today's study appears to explain why comedians of a certain appearance would have been drawn to their career. Dr Little said Mr Cameron's round and wide facial shape, large eyes and soft features meant he had the right natural physical attributes for comedy. Other famous funny faces include Manchester United star Wayne Rooney and celebrity chef Jamie Oliver. But Mr Cameron's rivals, Tony Blair and Gordon Brown, both had faces that were "too classic and masculine" to raise a laugh. Gervais: Is the key a 'fat, girly face'? He said: "Typically masculine facial traits, such as chiselled jaws and high foreheads are regarded as less amusing and their owners are less likely to succeed in a comedy career. "Faces of heroic actors are narrower than comedians', with greater definition, smaller eyes and prominent jaws. "Overall their appearance is very masculine, compared to the gentle, feminine qualities of the comedy face." He said Daniel Craig, the new James Bond actor, had both a heroic face and one which betrayed some feminine aspects. "He is well suited to play Bond since it's a role that demands a little spoof and light-heartedness as well as dashing masculine heroism." 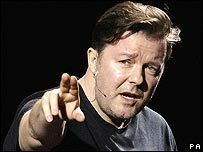 Ricky Gervais said: "All these years I assumed my global success as a comedian was down to my acute observations, expert directorial rendering and consummate skills as a performer. "Turns out it's because I've got a fat girly face." Comedian Hal Cruttenden said the research was probably on to something. He said: "Comics say things that are taboo-breaking, that are on the edge, and quite often the best comedy comes from really uncomfortable stuff. "So if it is delivered from a big-eyed, round-faced, slightly feminine guy it probably is easier for an audience to take."